Our Alton branch opened in October 2017. 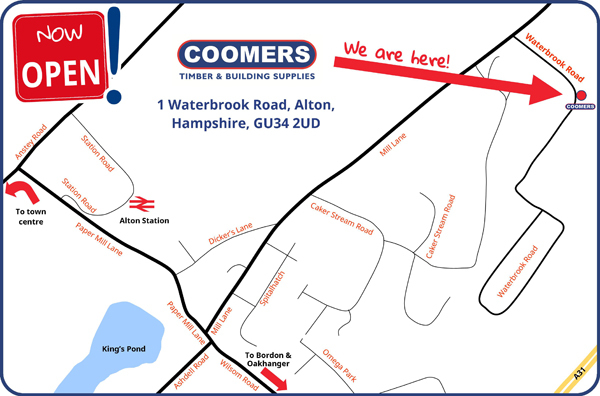 You can find us on Waterbrook Road - just off Mill Lane - in Alton, Hampshire. This brand new branch carries a comprehensive stock range, plus you'll also find a stunning bathroom showroom offering the leading brands at great prices, with full disabled access via a lift to the first floor! Visit our Alton page for an overview of our stock range or call us on 01420 571234. Our Oakhanger branch has closed but the nearby Bordon branch has been expanded to take on the extra stock previously held at Oakhanger, so you can now find all your timber, building, landscaping and DIY needs all under one roof at Bordon ... plus of course the kitchen and bathroom showroom! Meanwhile, over at Haslemere you'll still find all the usual timber, building, landscaping and DIY supplies, as well as the wood flooring centre. See a short preview inside our Alton branch on YouTube!